By most accounts, 2017 was a rough year for the National Football League. It was marred in controversies, the biggest being the phony one manufactured by President Donald Trump with his claim that protesting players were disrespecting the American flag and veterans. But the fallout eventually led to the creation of a players council and the NFL agreeing subsequently to donate millions of dollars to designated player charities. Sadly, the players council also had its own internal problems, with some members eventually opting to quit because they felt there were ethical issues involved with certain players’ participation. But whatever the final result of that, it was notable that the NFL did actually acknowledge player protest and did NOT attempt to change rules regarding behavior when the National Anthem is being played. The absence of any job offer to Colin Kaepernick, continuing concerns over the connection between football, concussions and long-term brain damage, officiating problems and another dip in ratings were other things that proved problematic for the NFL in 2017. But one area where the league has and did make progress concerned hiring, and most notably hiring of head coaches. For the first time since 2011 there were eight minority coaches on the sidelines for pro football teams this season. Seven of them were Black, and two have had substantial impact and enjoyed major success. 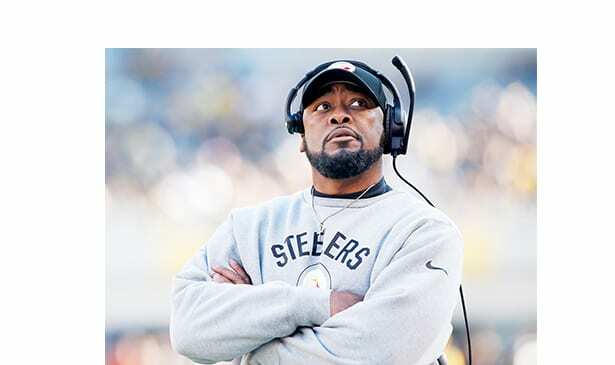 The Pittsburgh Steelers’ Mike Tomlin remains easily the most high profile and successful NFL Black coach, the only one among the current crew with Super Bowl victories as both a head and assistant coach. Tomlin’s Steelers earned a first-round playoff bye, though they also had a very disappointing home loss late in the season to their nemesis, the New England Patriots. Still, there’s no other team in the AFC that seriously could prove a threat to the Patriots’ chances of returning to the Super Bowl, and if the Steelers don’t at least reach the AFC championship game there will be considerable folks surprised and disappointed. First-year coach Anthony Lynn not only presided over the Chargers making the move from San Diego to Los Angeles, but was also able to overcome severe early season problems and get them into post-season contention by the final weekend. Though at press time their playoff chances were thin, Lynn’s ability to spearhead a comeback when the season looked lost was certainly noticed. Likewise Todd Bowles of the Jets took a team that most folks thought would be lucky to win three games and kept them competitive. They won five games going into the final weekend, and Bowles was rewarded with a two-year extension. On the flip side, after getting a one-year extension in the offseason, the Lions’ Jim Caldwell suddenly found himself in trouble after his team blew a must-win game against the Bengals. His status at press time was viewed as very shaky. The Bengals Marvin Lewis was almost certainly going to at minimum vacate his head coaching job after 15 seasons. Lewis will leave as the coach who got the Bengals back into contention, leading them to the playoffs seven times during his tenure. Unfortunately he was never able to win a playoff game during that time, and his last two seasons have been losing ones. However he was expected to either take another job with the Bengals’ organization, or maybe put himself on the market for one of the openings that was sure to emerge later in the week. Despite only winning one game in two seasons, the ownership of the Cleveland Browns maintain that Hue Jackson will return in 2018. However a lot of observers view that with great skepticism, so that one remains one to watch. The most uncertain in terms of Black coaches is Denver’s Vance Joseph. His team was expected to contend for an AFC West title, but instead missed the playoffs, in large part due to wretched quarterback play. Whether John Elway blames Joseph for that, or gives him another chance while finding a franchise QB for his team remains to be seen as well. But whatever happens this week, 2017 will be remembered as a year when there were more Blacks running NFL teams than at any time in recent memory. That’s one of the few good things that the league can and will cite when they go back and review this one in future eras.